Choosing a career can be a difficult decision for many people, especially if one of the considerations is nursing. Yes, it's a lucrative and fulfilling career for most people who enter the field, but it's by no means an easy one. You'll have to develop patient care skills and become licensed, for one, but you'll also have to wear a number of different hats once you're on the job. If you're doing some career exploration, or torn between a few different professions, comparing their parallels and differences to nursing might help you make your final decision. Take a look as we pit nurses against a number of popular career paths you might be contemplating. 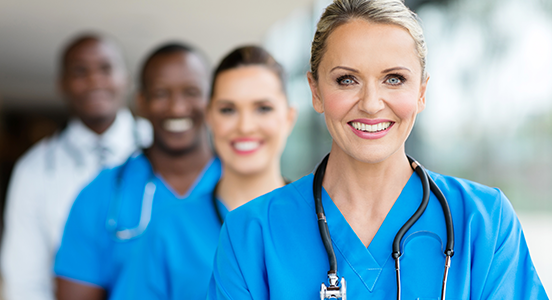 You may be surprised at some of the similarities, or swayed by the characteristics that make nursing unique and special. Because these are two careers that focus on helping others, and providing some form of care, in many ways, nurses and teachers aren't all that different. Both roles require dealing with people from all walks of life, working as part of a team, and following some sort of an established system of best practices. Nurses also act as educators when they have to teach patients and family members how to manage their own care. What's more is that both jobs require licensing and offer advancement opportunities and specializations if you're willing to pursue graduate studies. The big difference here, besides the type of work setting, are the hours. Teachers usually work an academic-year, school-day schedule, while nurses work year round and oftentimes, nights, weekends, and holiday. Best of both worlds : If you're truly torn, there are a couple of ways to combine your passion for education with nursing. One is you can become a school nurse, an RN who cares for injuries and illnesses that happen to students during the school day.The other is to become a nurse educator, teaching nursing students. If you are excited by the idea of looking for clues, gathering evidence, and solving problems, that can easily be applied to both nursing and police work. While the heart of your job as a nurse is patient care, you will likely spend part of your day doing diagnostic exams, asking questions, and reporting back to your medical team – kind of how a detective investigates a case. The major difference between these two worlds is that you're likely dealing with a higher degree of danger in law enforcement. But, you probably don't need as much formal education to move up the ranks. Best of both worlds : A great way to combine your two interests is to become a legal nurse consultant or a forensic nurse. Both of these specializations put you at the center of legal or criminal cases, while still relying on your medical expertise. Legal nurse consultants provide expert testimony and assistance to legal teams; forensic nurses deal exclusively with victims of violent crimes, and may also be called upon to testify. Both of these professionals put out fires – just different kinds. In other words, both nurses and firefighters must deal with high stress situations that could involve life and death. What's more is that many firefighters are also trained as paramedics, so they are trained in how to administer first-aid and emergency care. Obviously, both occupations are 24/7, but there is a much higher physical requirement and potential for personal injury as a firefighter. Nursing, however, requires more formal education, although some fire departments do seek candidates that have college credits. Best of both worlds : If your ideal nursing job is one that is action-packed and fast-paced, you can work your way into an emergency room or trauma unit. There are also military nurses who provide on-scene care to soldiers, sometimes even in war zones. If the main career goal is to help others, it's no wonder why you'd be torn between these two very noble professions. Social workers help people through a variety of life challenges, some of which aren't related to medical conditions. With nursing, you're primarily involved in the health outcomes of a patient. The other major difference is compensation. Social workers typically earn a lot less than nursing professionals, even though many of them must attain a bachelor's degree or even a master's degree to work in the field. Best of both worlds : If you truly want to advocate for your patients, one way to do that and still be a nurse is to become a Nurse Case Manager. In this role, you're the liaison between the patient and the care solutions providers needed for long-term recovery. On the social work side, if you become a Clinical Social Worker (versus non-clinical), you'll get to be more hands-on with helping families deal with serious illness, substance abuse, and domestic conflict. As you can see, becoming a Registered Nurse comes with many of the same responsibilities as professionals in other fields. The very nature of the job requires you to be a good communicator and teacher, a person who can gather information and make smart decisions, someone who can deal with stressful situations, and a person who cares deeply for the well-being of others. Thanks to the many specializations within the nursing profession, there are lots of opportunities to dip your toe into other fields so you don't necessarily have to choose one over the other. What your decision really comes down to is whether or not you enjoy the basics of nursing, and if you can find a way to make it fit your lifestyle and interests.